Tag-Archive for "St Nicholas Abbey"
This weekend (13th and 14th October 2012) sees the return of the UK RumFest and this year’s show has moved to new premises at the ExCel London Exhibition Centre in London’s Docklands. Promising to bring an “unrivalled combination of the rarest and most delicious rums from across the globe”, the show is back for it sixth successive year and will be continuing to mix rum, Caribbean food and a Carnival atmosphere of live music and exotic rhythms. For anyone with at least a passing interest in Rum and Sugar Cane Spirits, this is the place to be with some of the biggest names in the business sharing the hall with the smaller and boutique rum brands, who may not be so instantly recognisable to the average consumer, but whose drinks often rival the big boys for quality and taste. While some of these smaller brands will be out on the main floor, some of them will only be available at this year’s Boutique RumFest, which is a trade only show, taking place over both days of RumFest. This year’s exhibitors at both the Boutique RumFest and the actual RumFest include: Angostura, Appleton Estate, Bacardi, Banks, Ron Barceló, Blackwell Rum, Ron Botran, Bristol Classic Rum, Ron Brugal, Chairman’s Reserve, Cruzan, Doorly’s, Ron Diplomático, Don Papa, Don Q, Rhum Dzama, El Dorado, Flor de Caña, Green Island Rum, Gosling’s, Koko Kanu, Lamb’s, Ron Legendario, Mount Gay, Mount Gilboa, Old Grog, Pink Pigeon, Plantation, Pusser’s, Pyrat, Ron de Jeremy, R St Barth, Rum Fire, St Aubin, St Nicholas Abbey, Takamaka Bay, Toz, Wray & Nephew, XM Royal and Ron Zacapa. 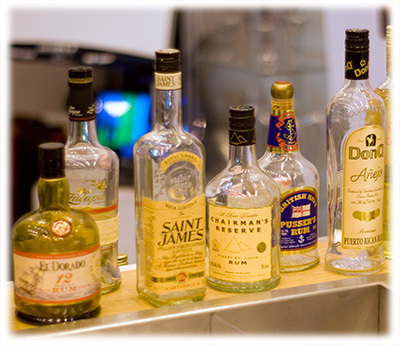 Alongside the exhibitor stands with their 400+ rums, visitors can also extend their knowledge in all things Rum related at the Rum University Room, where they can learn about the history of rum and rum cocktails with a number of seminars provided by master blenders, distillers and drinks experts. In addition to the Rum University, you’ll also have the chance to find out what goes on behind the scenes at some of the country’s top Rum bars, with the Cocktail Academy. 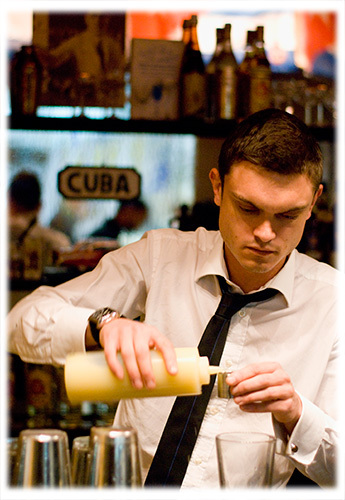 Bar tenders from bars such as London’s Trailer Happiness, Wax Jambu, Mahiki and Manchester’s The Liars Club, along with several others, will show visitors what makes them the best in world at making and creating Rum cocktails. 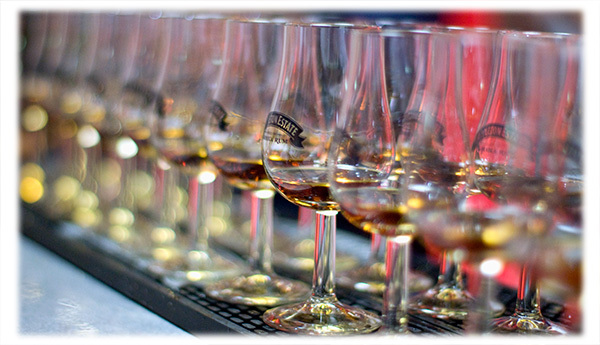 For further details, please look at the RumFest 2012 Master Classes page. These seminars and tastings have limited spaces and as such operate on a first come first serve basis, so please register at the main entrance of Rumfest. In addition to the rum tasting opportunities, the foodie’s paradise that is the Tropical Food Market is set to expand on its success of last year, showcasing the finest delicacies and cuisine from the Tropics. Highlights are set to include: chocolatier Paul Wayne Gregory and Global Rum Ambassador Ian Burrell, who together will launch a bespoke range of chocolates that have been crafted to perfectly compliment the unique flavours found in a number of carefully selected rum brands; Caymanas Rum Cake, which following last year’s RumFest has secured a deal to stock its products with one of the UKs leading supermarkets; as well as the opportunity to see celebrity chefs and presenters on the Angostura Bitters stage, who will be tasting, discovering and exploring rum beyond simply drinking it. Alongside the food and drink enticing the senses, attendees will be able to feel the tropical spirit through the music and Carnival vibe of Mas Band: Bacchanalia. Returning for another year of Soca and Samba music, Bacchanalia will be bringing the Carnival spirit to a possibly cold and dreary London with uplifting dancing and stunning costumes. Tickets are available in advance online at £25 for the Saturday, £20 for the Sunday or for a weekend pass at £40 per person. For your money you will receive: Access to the world’s biggest Rum Festival from 12pm to 5pm; with over 400 rums to sample; 5 Rum sampling vouchers; Live musical entertainment, cocktail master-classes and demonstrations* and your exclusive goody bag with tasting glass and show guide. *subject to availability. 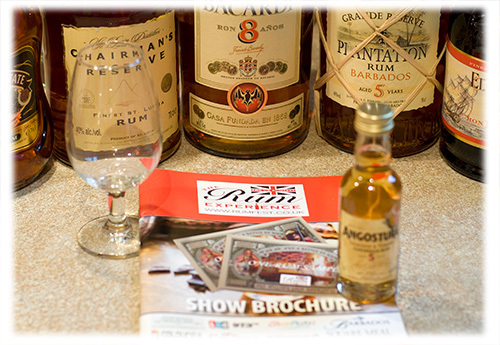 For those new to RumFest, the sampling voucher is the show’s currency and will need to be handed over for each sample. 1 voucher = 1 sample. Additional vouchers can be bought from the front desk for £1 each. There’s also a limited number of VIP tickets for both days, priced at £40 for the Saturday and £35 for the Sunday, giving: access to the show from 11am – an hour before general admissions; fast track entry into the show; entry into the V.I.P room, including 3 cocktail tokens; Rum Experience Rum Cake; a show goody bag, including 5 Rum sampling vouchers, tasting glass and show guide. Those in the drinks trade can also attend The Boutique Rumfest, where you will have the chance to explore a range of new and boutique distillery rum. So make sure you register for the show and head down to the ExCel Exhibition Centre over the 13th and 14th October. Please remember that entry to the Boutique RumFest still requires a valid ticket to RumFest. I know that I’m finishing with the same line as I did last year, but I think it so amply sums up my expectations for this year’s RumFest: So for more rum than any one man or woman could handle, live Caribbean music, great food and a totally tropical weekend, make sure you finish the London Cocktail Week by heading to the ExCel London Exhibition Centre for the UK RumFest, this 13th and 14th October 2012. Organised by The Rum Experience, ‘UK RumFest is an international celebration of rum & cane spirit’. Headed by Ian Burrell, The Rum Experience aims to promote rum & cane spirits in both the UK and around the world. And if the continued penetration of premium rum and Cachaça in the UK is anything to go by, I’d personally say that they’re succeeding in that aim. Still misunderstood by many, rum and cachaça continue to enjoy a rise in popularity both in the trade and retail sectors and show’s like RumFest continue to promote the positive range and versatility of cane spirits. So over the weekend of the 15th to 16th October 2011, between the hours of 12pm and 6pm, Kensington’s Olympia 2 will be transformed into a tropical island paradise. Along with the rum tastings; rum masterclasses; live cocktails demonstrations; live Caribbean music; competitions and the opportunity to be among the first to try new rums to the UK market, several new additions this year include a new Tropical Food Market, the Tiki Bar Tender of the Year competition, as well as the trade-only Boutique Rumfest. This year’s exhibitors include: Angostura, Appleton Estate, Atlantico, Bacardi, Banks, Ron Barceló, Ron Botran, Bristol Classic Rum, Ron Brugal, Bundaberg, Captain Morgan, Chairman’s Reserve, Rhum Clement, Cruzan, Doorly’s, Ron Diplomático, Don Q, El Dorado, Flor de Caña, Germana Cachaça, Green Island Rum, Havana Club, La Mauny, Lamb’s, Leblon Cachaça, Koko Kanu, Mahiki, Mount Gay, Mount Gilboa, Myers’s, Pink Pigeon, Plantation, Pusser’s, Pyrat, Rhum J.M, Ron de Jeremy, Ron Santa Fe, St Barth, Rum Fire, Sailor Jerry, Santa Teresa, St Aubin, St Nicholas Abbey, Toz, Trois Rivieres, Wray & Nephew, XM Royal, Ypioca Cachaça and Ron Zacapa. This isn’t an exhaustive list and I’d certainly expect to see many other brands on show between the Boutique RumFest and RumFest itself. With RumFest being such an important event on the rum calendar, you can expect to find many of the top people in the rum industry attending, including many of the rum brand ambassador’s, distributors, a number of master distillers and of course several of my fellow rum bloggers. With many of the brands showcasing their latest bottling’s at RumFest along with the many rum tastings and seminars, the Tiki Bar Tender of the Year competition live on stage and the results of the Golden Rum Barrel awards, it really is the place for any rum-lover to be. Of course, tropical culture isn’t just about drinking rum and in true Caribbean style, the weekend will also feature live bands, playing a mixture of reggae, salsa, samba and zouk. For those who find the tropical beats and rhythms too much, relax with Bacardi at the Dominoes and Daiquiri Zone and try your hand at one of the tropics most relaxing pastimes. To complete the party why not head to the new Tropical Food Market, featuring some of the finest delicacies and cuisine from the tropics. Here you’ll find chef’s competing in the Rum Experience Chef of the Year competition, hoping to win an all expenses trip to Barbados, as well as demonstrations and seminars from the highly acclaimed rum chef Paul Yellin. Having travelled the Caribbean discovering many tropical dishes, let Paul show you how to use rum in your cooking. There’s also a limited number of VIP tickets for both days, priced at £40 per day, giving: fast track entry into the show; entry into the V.I.P Aged Rum Experience room; an exclusive Rum tasting masterclass; an exclusive rum & chocolate master class; a V.I.P goody bag, including a world exclusive new ‘Burrell Rum Glass’; Caribbean Canapes from Cottons Camden Restaurant and Cocktails from Appleton Jamaica Rum. Those in the drinks trade can also attend The Boutique Rumfest, where you will have the chance to explore a range of new and boutique distillery rum, as well as attend seminars and tastings such as: Santa Teresa Tasting; Let’s Talk Rum; Diplomatico Tasting; Don’t Fear the Blender; The Art of Distillation; The Grand Tasting; El Dorado Tasting and the Bacardi Legacy Seminar. So make sure you register for the show and head down to the Hilton Olympia between 12pm and 9pm, on Friday 14th October. 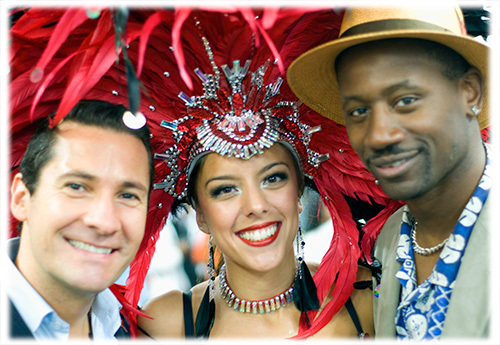 So for more rum than any one man or woman could handle, live Caribbean music, great food and a totally tropical weekend, make sure you finish the London Cocktail Week by heading to the UK RumFest 2011.